Since one of the keys to precision is utilizing locations that are constant, a review of the NHPA Pit Specifications is in order. The NHPA permits the “Pit” area to vary. For clarification, when I indicate “Pit” I’m identifying the area containing the stake. The area to either side is the “Approach”. However, they also require that the pitching platform is an area that is 6 feet by 6 feet. That means that no matter how wide the pit is, the outer edges of the left and right approaches are 36″ to the left and right of the stake. This is important if you are confronted with a pit that is only 15-1/2″ from the imaginary stake to the edge of the left or right approach. You must be able to deal with pit width variations. The geometry of the setup and delivery described in Parts 41-43 is precise relative to all lines and body relationships, however, they are actually independent of either approach. So, it is possible to move the geometry to any location on either approach. If you think of the distant stake as the radius of a larger 30 foot circle you would be able to rotate the entire geometry to either approach. So, it is possible to move the geometry to the left edge of the left approach or the right edge of the right approach. The 3 images below demonstrate how the geometry rests on the approaches when rotated from the distant stake. Even though the foot positions shown on each approach are different, they are still relative to the foot positions of Parts 41-43. 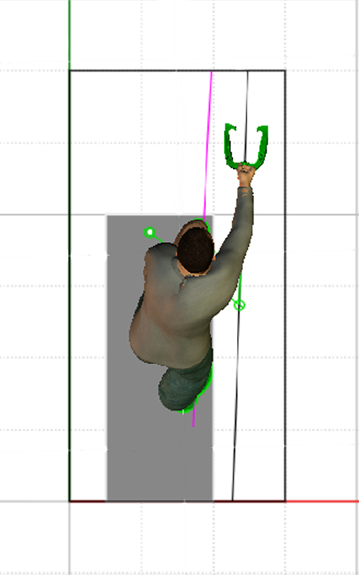 Further, the shoulders rotate 13 degrees from the Setup position to the Delivery position in all cases. Rotation to the Left Edge of the Left Approach (Above) — In this rotation you will note that the left foot on the left edge is almost parallel to the left edge. In addition, the Visual Alignment Point will have moved further to the right. This pitching position presents an angle to the stake as far to the left as possible. Rotation to the Left Edge of the Right Approach (Above) — In this rotation you will note that the location of the left foot after the stride forward is very close to the left corner of the right approach. In addition, the VAP has moved closer to the stake. The distance to the stake may not always be 18″ from this setup. Rotation to the Right Edge of the Right Approach (Above) — I consider this location to be the best for the 30 foot flipper for several reasons. First, it’s the most precise location for NHPA spec platforms on the right approach. Secondly, it presents the greatest angle to the stake from any position on the left or right approach. I consider this an advantage for flipping pitchers to reduce bounce back. In addition, the VAP moves very close to the stake. Finally, it is actually possible to look down the Line of Flight from this extreme rightward position. It does require a cocking of the head to the right until you are looking straight down the LOF. Below I’ll describe an aid that verifies that you are actually looking down the Line of Flight. 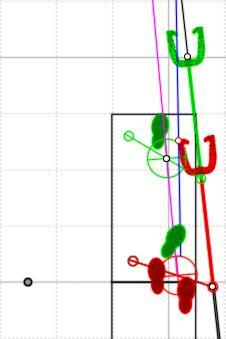 If you happen to be a pitcher who cannot stride due to leg problems, you can move your left foot to the right corner of the approach and look straight down the LOF. In this case your Visual Alignment Point and Line of Flight are the same. 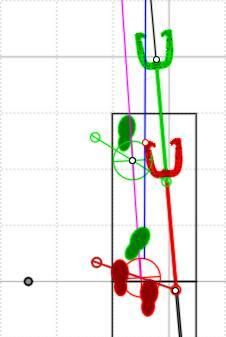 You also have the advantage of completely eliminating the stride, which is sometimes a cause for misses. If you started with Part 41 you were introduced to the necessary cords and anchors for the Line of Flight and perhaps you added cords for the VAP and/or Visual Stride Direction. I would like to introduce the most important Helping Aid I’ve found….the TAMPER. I place it on various locations of the LOF for checking my on line delivery, my backswing stop point, my VAP, and checking to see that I’m moving directly at the stake. In this case, we’ll be using it to make sure our eyes are directly over the Line of Flight from the right side approach. You can purchase a tamper at most DIY stores for $20 to $30 dollars. I guarantee that it will become your favorite helping aid during practice sessions. For this use we’ll need a second cord and the tamper. First, connect each end at the anchors now being used for your Line of Flight. You should now have two cords, one on top of the other. 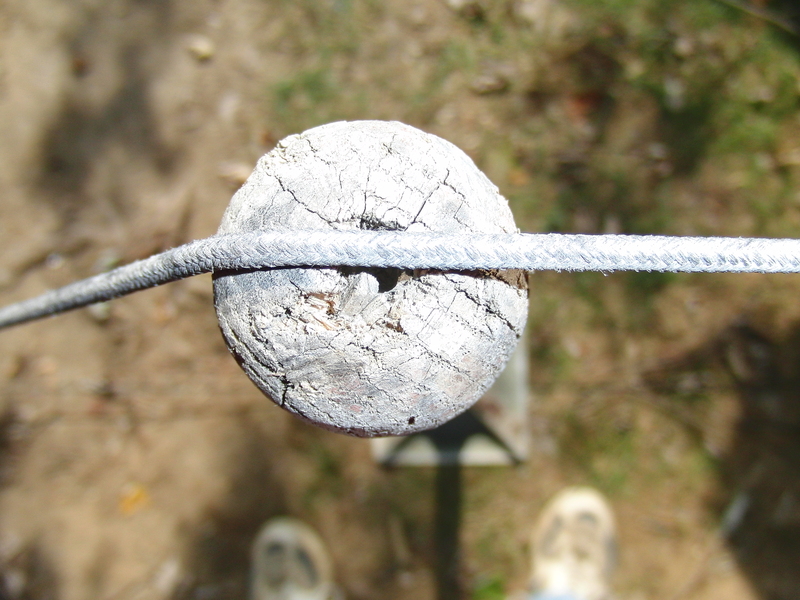 Next, position the tamper directly over the Line of Flight cord about 6 feet in front of the pit. Make sure the tamper is straight up and down. Now grab your newly placed cord and rest it on the top of the tamper handle. You should now have two cords one over the other. As you setup on the right approach tilt your head until the top cord is directly over the bottom cord. You are now looking straight down the Line of Flight. In this case your Line of Flight, Visual Stride Direction and Visual Alignment Point are the same. Keep the cords in line and throw the horseshoe directly over the top of the tamper. Nothing beats throwing directly at what you’re looking at. See image below. If you look carefully you’ll see the Line of Flight cord directly under the center of the tamper. At this point you have previously established your setup (Phase 1) and determined your Visual Alignment Point (Phase 2). Phase 3 begins with the back swing from the address position using the VAP. To review, we have started with the horseshoe resting on our right leg with the Center of Gravity directly over the Line of Flight, 3-1/2″ to the right of the right edge of the approach, and, the left shank directly above the right edge of the approach. From this position, we swing the horseshoe up the address position with the left shank aligned with our Visual Alignment Point. So far, you have only moved your fully extended arm and horseshoe to the VAP. Nothing else has moved. As you start the horseshoe downward with the fully extended arm, your goal will be to pass the horseshoe as close to your right leg as possible. This continues to maintain your marriage to the Line of Flight. To this point you have only moved your fully extended arm. In other words, you have not moved anything except your arm from your right leg to your VAP back as close as possible to your right leg to your back swing stop point. The forward delivery now begins. The delivery, Phase 3, begins when your back swing reaches it’s stop point. As a reminder — your left hand is firmly planted on your left leg above the knee and will remain there throughout the stride forward. Your left foot is pointing directly at the right corner of the approach. Your upper body is still rotated clockwise at 27 degrees. Your right foot is still planted at the right edge of the approach adjacent to the imaginary stake. Your arm swing starts forward simultaneously as your left leg begins it’s stride forward towards the right corner of the approach, and your right leg slides forward about 12″, items #1. Your head moves in a direct line at the stake, indicated by the Magenta line on the image above, item #3. Do not dip your body downward. Your body will automatically begin to rotate under your head as your left leg moves forward controlled by your left hand on your leg and should finish at an angle of 40 degrees, items #2. This rotation will insure that your right shoulder remains on the Line of Flight. Your timing should allow your left foot to plant slightly before you release the horseshoe. Below is an image that shows the termination points of each of the lines. The Black line (LOF) and Magenta line (Visual Stride Direction) terminate at the stake, while the Blue line (VAP) terminates at a point to the right of the stake shown with a pipe ~32″ to the right of the stake at the adjacent approach. NOTE: The termination point of the VAP is a personal one, based on the pitchers height, angle established by the weight shift rightward and/or angle of the head. If all has been done correctly, your pendulum swing will continue on a direct line to the stake. CAUTION: If you allow your left hand to leave your left leg/thigh, your shoulders will not rotate around clockwise correctly, by the 13 degrees they need to, in order to keep your right shoulder over the Line of Flight. Typically, you will miss to the left of the stake. In addition, if your left foot does not reach the right corner of the approach, this same rotation may not take place. Again, you’ll miss to the left. Your left hand does not maintain contact with your left leg. Your left foot does not stride properly to the right corner of the approach. Your arm swing took your horseshoe off the Line of Flight. You have over rotated your shoulders. Your right arm was not fully extended and straightened prior to release. Using the Plumb — As you practice this rotation of your body from the shoulders down, you might want to test your alignment with the plumb. Simply go through the same process of attaching the string and plumb as in Phase 2. As you stride forward and swing your arm up toward the stake, complete your stride and stop somewhere on your upswing and make sure the plumb is still directly over the Line of Flight. See image below. This completes the 3 phases of the setup, alignment and delivery. The geometry required to keep your shoulder moving down the Line of Flight, the geometry necessary to keep your head moving directly at the stake during the delivery and the geometry necessary to align your eyes to a fixed point over the Line of Flight is complete. In the image above the pitcher has reached the end of his forward stride and delivery. 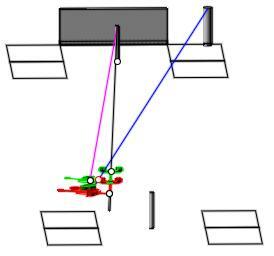 His left toe is at the right corner of the approach and his nose continues to move directly at the distant stake (magenta line) and the Center of Gravity of the horseshoe is still over the Line of Flight. The pitcher started his alignment with his shoulders rotated 27 degrees clockwise and finished with his should rotated 40 degrees clockwise. His shoulders have rotated under his head while his head continues a straight line at the stake. This 13 degree rotation accomplished by the stride insures that the right shoulder continues to follow the LOF. You will note that the Line of Flight and Visual Stride Direction are slightly different. They are not parallel. They do converge at the stake, but, the difference is due to the distance between the center of the head and the pitching shoulder. TROUBLESHOOTING — If you miss, why? Did you miss left or right? What did you do right? Assuming that your left hand remained on your left leg and you passed the shoe close to your right leg ticking the pant leg as it passed and your left foot is at the corner of the approach and your head moved directly at the stake — you swung off the Line of Flight somewhere during your backswing or forward swing. If your hand comes off of your thigh during your forward swing or your stride took you to the left, you’ll miss left. If your shoe goes to the right you’ve taken the shoe inside of the Line of Flight or you have swung your arm with a bend at the elbow which when straightened during the forward swing will cause the shoe to go right. It is important to keep your arm fully extended, without tension. However, if you allow it to get too soft, Centrifugal Force will straighten your arm and throw the shoe to the right. Good Luck to anyone trying this approach. The geometry described in the 3 Phases will define the LOF, VAP, and the Visual Stride forward. 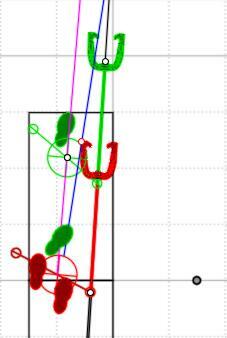 Any change in stance, alignment or delivery will defeat the angles relative to this method. You can move left on the left approach or pitch from the right approach as long as you adjust the angles relative to your stance on either side. If you have any questions, please feel free to contact me at the email address below. Once you are confident in the delivery direction you can then concentrate on distance, an open shoe and drop angle. 40 Foot Pitchers — All of the geometry that applies here to the 30 foot pitcher also applies to the 40 foot pitcher, with very slight differences. The angle away from the approach is slightly less.